Together, we can make a difference in the lives of breast cancer patients with no access to hospitals by flying them to treatment! With your support, we can provide women with life-saving Pink Ribbon Flights of Hope, giving them access to the breast cancer treatment they desperately need. Every $1 donated equals 1 mile of lifesaving travel. 100% of your donation will directly support flights! The hard truth is that many in need of aggressive, life–saving treatments are unable to access that essential care. If a medical specialist is not available in their city, many patients go without the care that could be the difference between life and death. GreaterGood.org partners with Angel Flight West to fly patients to the life-saving care they need. Your donations have made it possible for 17 patients to be flown on 105 flights in the past five months alone! LeeAnn is one of these resilient women, battling Stage IV Breast Cancer. 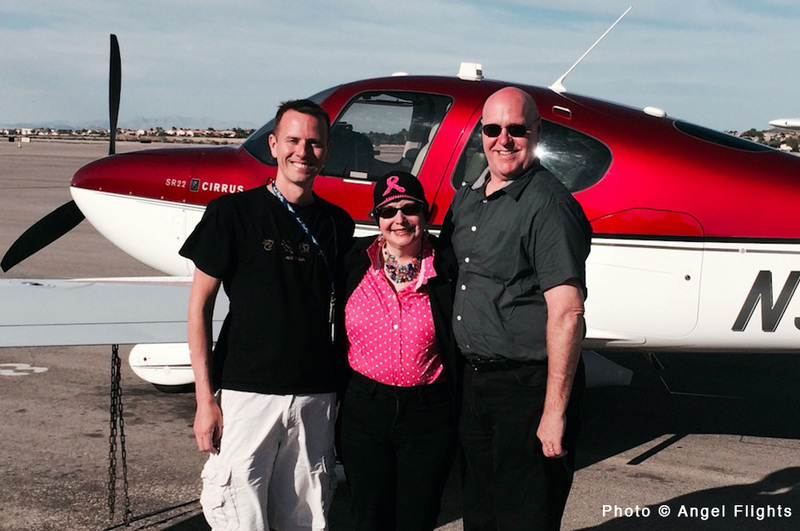 "LeeAnn, her husband, and an 'Angel' pilot, ready for another Pink Ribbon Flight of Hope!" LeeAnn's painful ordeal was complicated by a 500–mile drive to chemotherapy treatment in California: "These flights are life-changing!" You can help. LeeAnn is receiving the treatment she deserves thanks to you, but YOUR continued support can mean the difference for more brave women, providing them with access to another flight, and the care they so deserve. LeeAnn is one of many women we hope to support—join us to make this dream a reality! Together Angel Flight West and GreaterGood.org partner to fly patients to critical and life–saving surgeries, chemo therapy, and other medical treatment. Oftentimes, this also includes flying families to be by the side of a loved one who is undergoing treatment. Since its founding in 1983, Angel Flight West has flown over 70,000 flights.